Sign up with Big Ceramic Store for your very own 15% discount. 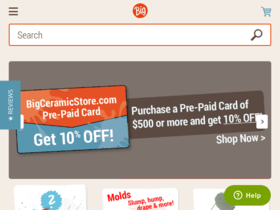 Use this coupon code at Big Ceramic Store to save $5. Buy more, save more with a 20% discount on glazes and underglazes at Big Ceramic Store online. Act now and take advantage of free shipping on most equipment, including kilns and wheels, from Big Ceramic Store. Check out Big Ceramic Store online for their latest special offers.